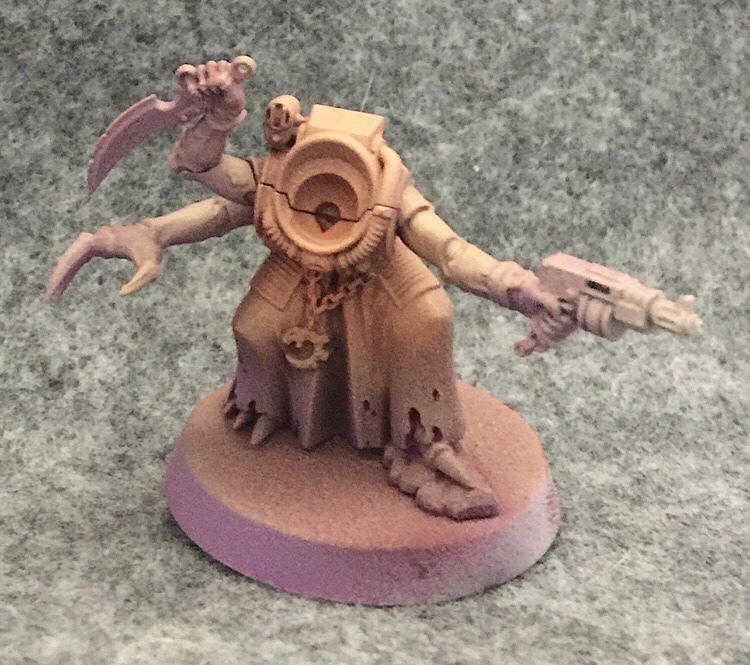 With the new Genestealer Cults Codex right around the corner, I thought I’d posts some step-by-step shots of the hybrids I’ve been painting up. I started off with a lot of airbrush base coating. I used more colors than was probably 100% necessary but a lot of this was about trying to improve my precision with the tool. I may have reached the limit of what my mid-grade brush can do for me or I may have needed to be more patient. As you can see I did manage to lay down some color and zenithal highlighting but none of the areas have any distinct color to them. I could have tried taping parts of them off but there are a lot of these guys to tape and the point was to see what I could do without tape. Even though it didn’t quite work out I still think it’s worth showing just to encourage people to experiment. These are all the colors I used. 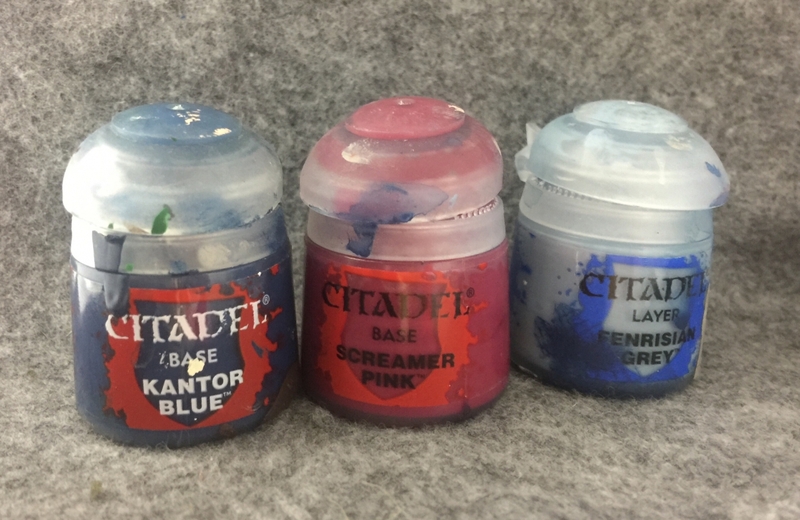 The Kantor blue was used as a base with the khorne red following up. The troll slayer orange was next. 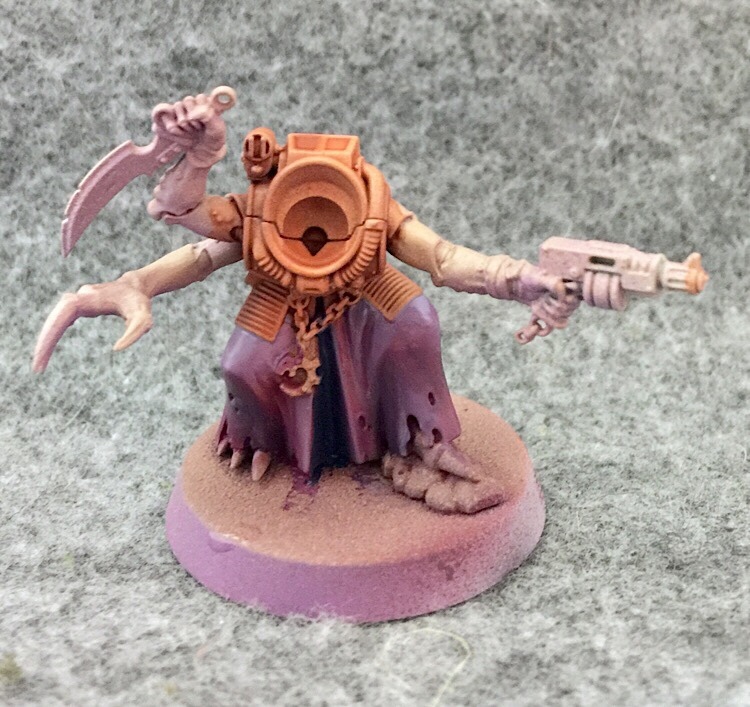 The genestealer Purple was supposed to go on just the arms. 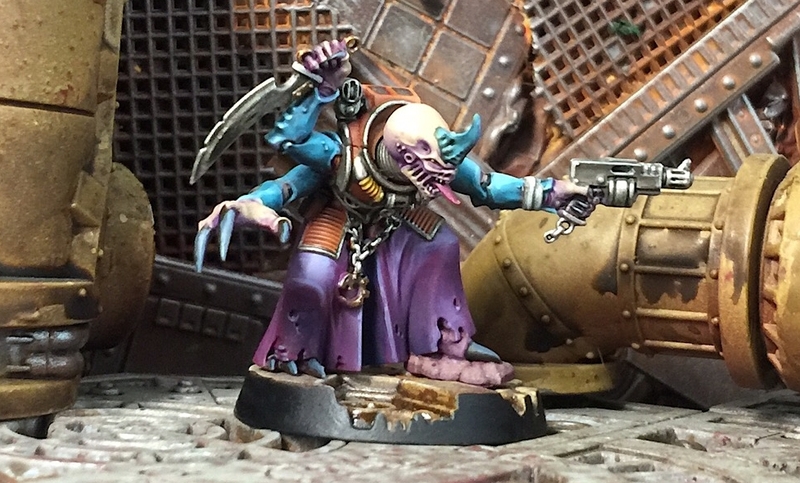 The Kislev Flesh highlighted everything. 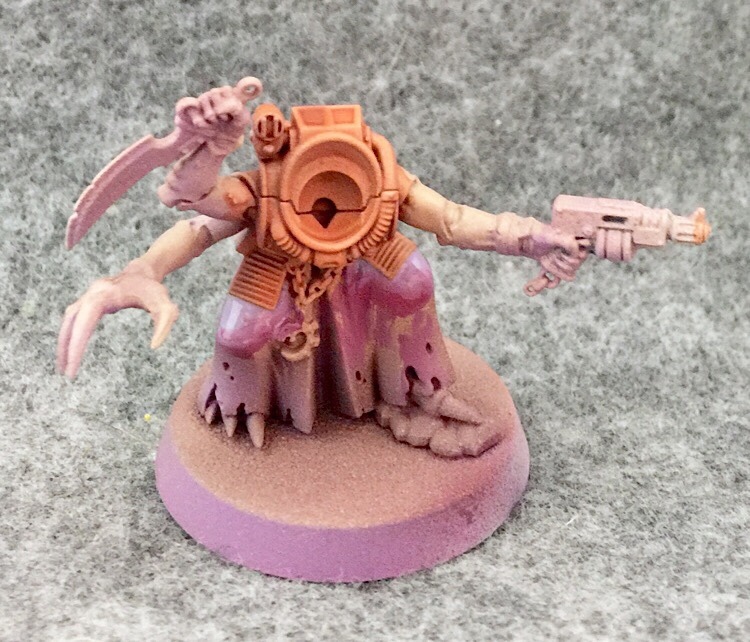 If you wanted to get a similar effect more quickly you could try just using the purple and Kislev Flesh. If you don’t have an airbrush try starting off basecoating with purple and dry brushing the flesh on. The next step is the easiest of the project. Give all the armor a wash of Fuegan Orange with a bit of Seraphim Sepia mixed in to darken it up. Next I start on the cloth. 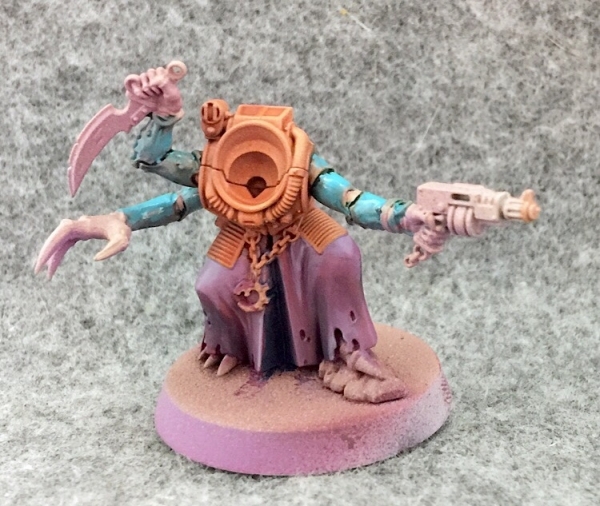 Here I’ve begun by laying down a highlight of Fenrisian Grey with just a bit of Screamer Pink mixed in. While it’s still wet I blend it in to the mid-tone color: Screamer Pink. These three colors were used for the cloth. The reds and blues blend together to create a kind of purple tone. Since this is the leader he has proper cult-y robes. 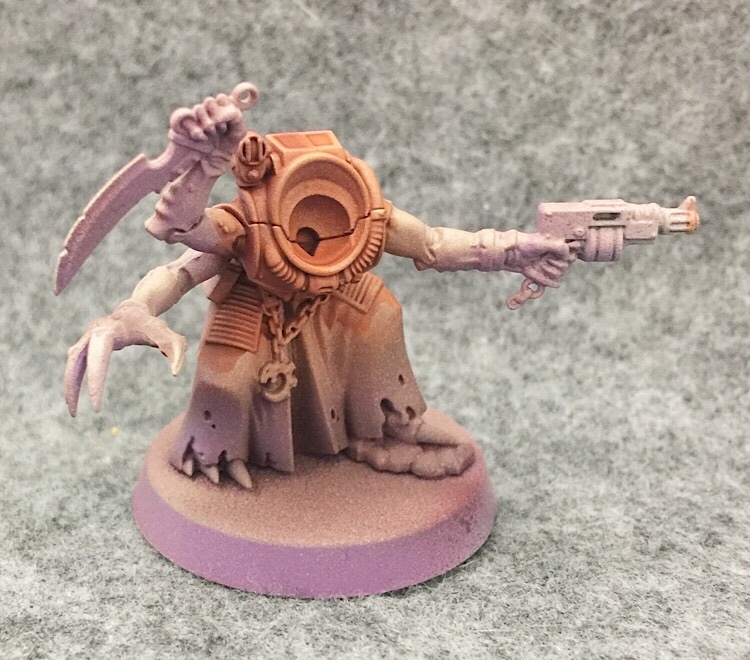 The same pallette is used on the pants and clothes of all cultists. Here I’ve begun blending the Kantor Blue into the recesses of the robe adding shading and depth. 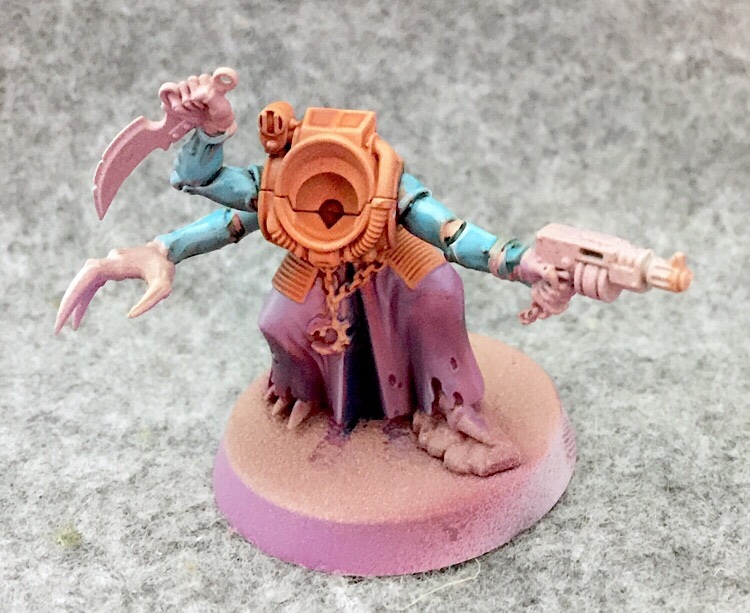 After cleaning up the blending with another thin layer of the same colors, I start on the chitinous genestealer segments. 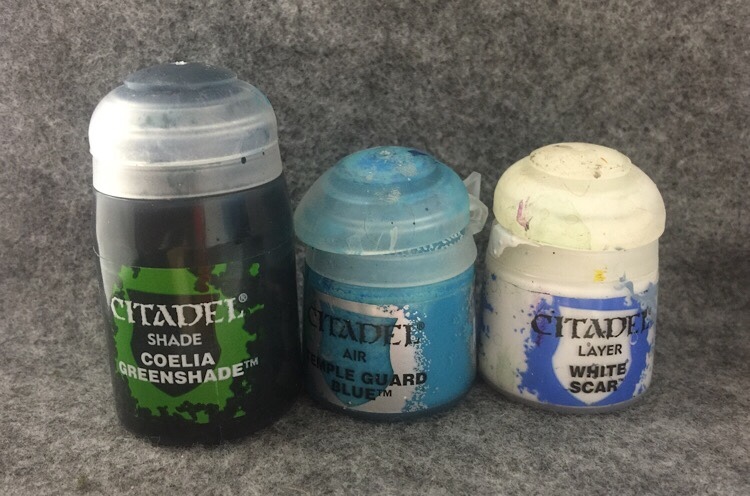 I start with a glaze of the coelia nightshade and begin blending in the temple guard blue while it’s still wet. If you’re careful the wet paint will bleed into the shade and help make blending easier. I happened to be using the air version of Temple Guard Blue while I was painting these guys. It works well on a brush but feel free to use the layer version. After the initial layer has dried I add some more Temple Guard Blue over the top. I add some more Nightshade in as well carefully applying it to the crevices and recesses to darken things up a bit. 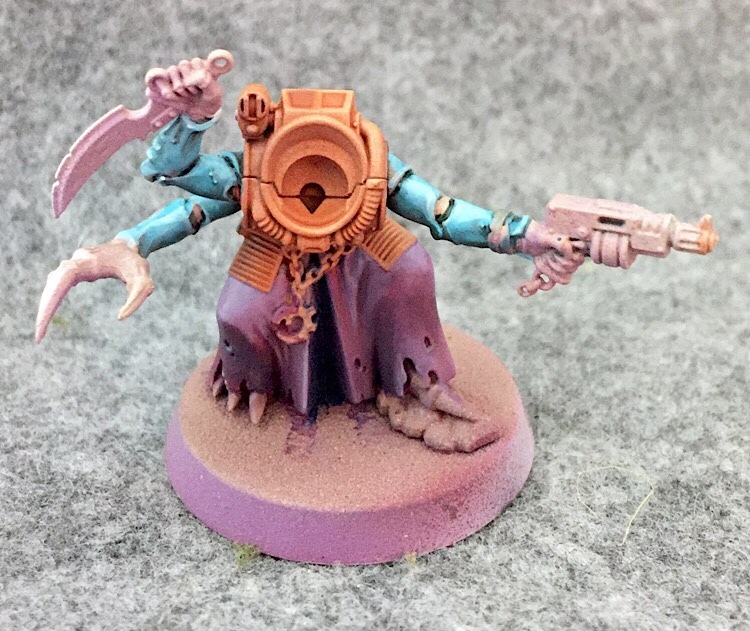 The last step is to blend in a little white to really make the highlights pop. ~That’s it for Part 1! Part 2 should go up soon!